KUALA LUMPUR (Sept 29): The FBM KLCI closed 0.32% higher, supported by gains in index-linked banking stocks. The KLCI had erased earlier losses amid dampened regional sentiment, as investors eyed Clashes between Hong Kong police and pro-democracy supporters. Malaysia's KLCI rose 5.84 points to end at 1,846.34 points at 5pm. 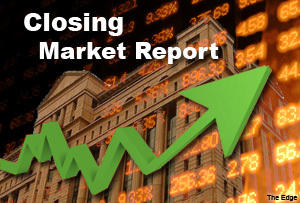 A dealer told theedgemalaysia.com the KLCI mirrored overnight increases in US markets, with gains in KLCI-linked banking stocks Malayan Banking Bhd (Maybank) and CIMB Group Holdings Bhd. “Banking blue chips like Hong Leong, Maybank and CIMB have supported gains in the KLCI today, but there is more interest in small cap stocks,” he said. Meanwhile, the ringgit depreciated against a strengthening US dollar, on expectations of interest rate hikes in the US. Bloomberg data showed the ringgit was traded at 3.2775 versus the US dollar, compared to 3.2600 last Friday. Bursa Malaysia saw 2.6 billion shares, valued at RM1.88 billion traded. There were 436 decliners against 371 gainers. The top gainer was Press Metal Bhd’s warrants PMETAL-WC, while the top decliner was Teck Guan Perdana Bhd. Malayan United Industries Bhd was the most actively-traded stock. Across the region, Japan’s Nikkei rose 0.50%, while Hong Kong’s Hang Seng and South Korea’s Kospi fell 1.9% and 0.25% respectively. Reuters reported Asian stocks stumbled to a four-month low on Monday as political unrest in Hong Kong rattled investors, while the U.S. dollar basked in the afterglow of data showing the world's biggest economy on a strong footing. In Europe, shares prices are expected to rise in sympathy with the rebound in U.S. stocks on Friday, following upbeat revised second quarter U.S. growth figures.